R's Halloween Party for school is tomorrow. I volunteered to bring the "treat" for the party. I *was* tempted for a split second to do something healthy since, let's face it, the sugar onslaught is about to begin. 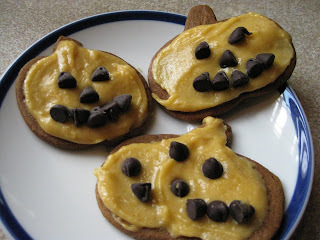 But I am a sucker for holidays and didn't want poor R to bear the brunt of his 4-year-old friends' wrath if their party treat was something like, carrot dippers in hummus. Mix all ingredients, adding enough sugar to make it stiff and spreadable. R, of course, was a very willing taste-tester. I joined him in a tasting and I have to say, they were beyond amazing! Very cute, and very impressive! HA! You crack me up. Carrots and hummus would make children hate you, except for my son. He would eat the hummus with his fingers. That's a great idea for the frosting. I'll have to try that one. Sounds delicious! I'm definitely going to try it out. Thanks for sharing. Cute pictures! Great idea on the frosting. Can you think of any way to make naturally red frosting? My son wants a volcano cake for his birthday party and I shudder at the thought of all that food coloring to make lava! Thanks in advance for any ideas you may have. I answered my own question - berries! Jen--I do have another idea...beet juice. It is an amazingly effective dye, just not sure if it would come out red, red or pinkish red. Mitch from www.familyeducation.com here. I wasn't able to find any contact info in your profile, but I wanted to talk to you a little about your blog. Could you shoot me a line? 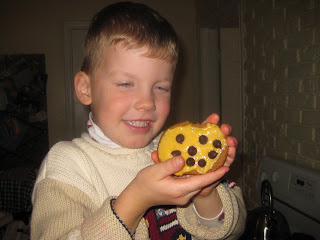 The spambot-proof email address is "feedback at fen dot com"
So nice you get to send homemade treats to school. I'm hoping I can get clearance for the Daisy troops meeting snacks when it's my rotation, otherwise it's storebought. And for Rachel's birhtday, you have to buy through the school cafeteria! Jenn, You are kidding me! Well, I am sure that is the least of all the shocks I am in for when R goes to kindergarten next year. Very cute and they sound delicious! Hello! Visiting from Tabitha's page! We are HUGE buckeyes! My hubby grew up/attended! So cute; what a fun idea! I am so sorry you couldn't get it too harden. I am not sure what went wrong, other than too much moisture? Maybe the pumpkin puree was more moist than usual? Either way--I am sorry for the frustration!! Next time, I would perhaps try 1/2 the pumpkin and add the sugar first...then thin it out a bit with a touch of cider, and see if this works better for you. AND, your meatless Friday plan for our meatless Mondays is such a great plan, I love it!